The first Saturday of the new year and its football in Tonbridge with 1 tick only in the GBG, which is the town's Wetherspoons. A few minutes before 11am when I walk in and it's pretty busy already with breakfast being very popular. 12 hand pumps in 2 banks of 6. One bank has 6 different ales on while the other bank has 2 each of Doom Bar, GK IPA and Ruddles. My pints of Flack Manor’s Flack Catcher @ 4.4% were all very good. My first visit to this ex post office. One level throughout with a raised level towards the toilets for diners. There is a pitched roof running almost the full length of the pub with slanted windows that let a lot of light in. Large garden to the rear which also acts as a smoking area. I've heard bad things about this place but on my Saturday visit that lasted over 3 hours I was impressed. There were at least 4 bar staff on with most of them actually knowing what they were doing. The clientele were mainly above 40 yrs old but I'm sure this changes at night & like a lot of town centre 'spoons probably takes on a less safer feel. On my visit however I couldn't fault it. Large, airy & with lots of natural light. Good range of small brewery beers. Pleasant place to have a drink or six. Whats the point in featuring Wetherspoons pubs on BITE? It doesn't tick any of the usual boxes that people here seem to value, i.e. it isn't filled with boring old men, it won't have obscure ales made in a shed down the road .. and there certainly won't be any "friendly" banter with the over the top barmaid who's only interested in your boring conversation about politics as she wants your money. I go to this pub because I want a) cheap beer and occasionally b) cheap food and I want a place to sit down not huddle round an old bar with a bunch of bearded pseudo-toffs. Of course it's full of the usual dregs and drunks of society, as is the case with every Wetherspoons, but that's half the fun. Perhaps it would be best to say that I had heard �mixed reviews� of the Wetherspoons outlet in Tonbridge before my first visit. Some, a few years older than me, opined the seemingly general impression that it was a bit of a hole, but served cheap and good beer. Some others avoided it at all costs (although they tended to be older and therefore less likely to frequent a �Spoons anyway), saying that it was scummy, overrun by drunks, filled with unhelpful staff who serve kids with no issues, and generally only preferable to the seventh circle of Hell. It seemed as if I would have to formulate my own opinion on the place, and now that I�ve been a fair few times, I think I have. 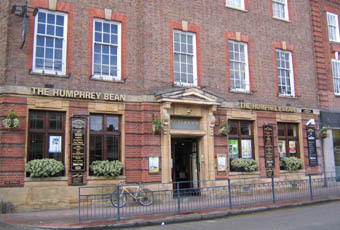 Firstly, one�s experience of The Humphrey Bean will depend greatly on the time of day or day of the week at which one visits it. A very large building, it can admittedly feel deserted at, say, early evening on a Tuesday, but when Friday or Saturday night rolls round, it seems the perfect size to accommodate the crowds of drinkers that descend upon it. Seating is generally plentiful (even on those busy nights- I have only experienced �standing room only� once and only then for ten or so minutes), and comfortable enough, although with the sheer number of winos that will unfortunately always be drawn to places like Spoons, some of the sofas and booths are a little dilapidated. So far, so good, then; indeed I believe that there has been a recent effort to improve conditions at the pub, with new toilets being installed and natural light maximised. The beer garden is spacious and provides an area for smokers to go without necessarily feeling excluded or having to leave their friends for example. Maybe just to counter this predominantly positive report, there are some drawbacks to this pub. The bar staff range from helpful and funny to unresponsive and brusque, which can spoil an evening at any pub (although with such a large bar to run there are bound to be a few issues). A depressingly high proportion of the locals seem to be decrepit drunks who really should be receiving help from the state rather than being allowed to spend their time killing themselves in a boozer, and I have heard of (although never experienced) fights and other disgraceful occurrences there. There will never be a friendly feel to the place, simply because it is too cavernous and alternately packed or deserted; it may be that the best you can hope for is not to have a bad experience rather than hoping for a great one. That said, age also comes into the equation when rating this pub. As a young man myself, my friends and I can enjoy the positives of cheap beer and spirits (and, if you prefer ales like I do, there is an excellent choice of well-kept local varieties available). TVs and fruit machines/quizzes will also appeal to the younger customer, but what many people have to realise is that the young comprise Spoons� target audience. It may not be traditional, but it gives young adults a place to go to enjoy themselves, with well-priced food and drink, plus other distractions. These serve to mostly eliminate the negatives which are very difficult for even the best Spoons outlets to shake off (�soulless�, �unwelcoming� etc.) As a final point, as with most pubs in general in recent times, there has been a clamp-down on ID checking by staff, which can only be a good thing. Although the presence of bouncers on busy nights may not give the pub the best of images, it is simply a necessity and prevents the bar from being filled with those too young to drink trying their luck. Overall, seeing as I have always enjoyed a bit of banter with the bar staff (which is in as good supply as the beer), and a relaxed pub to while away a few hours with mates, Tonbridge Spoons will continue to be my first port of call for a good night out in my home town.